Our Italy itinerary is what pushed us into taking a major decision that we would be doing a self-drive Road trip in Italy. Our Italy driving holiday itinerary had an equal share of big and famous cities and the less visited yet well-known places. Though Italy has a good network of trains – It would have been difficult to travel by train to all the places marked in our Italy Road trip Itinerary. After I wrote this post about ‘Things to know before you self-drive in Italy’, I got a lot of questions about places we traveled across Italy on our road trip. So, I decided to write this post which help your road trip through Italy. Be it 1 week or 10 days, this itinerary will help you while driving around Italy. This itinerary covers most of the beautiful and famous spots in Italy making it one of the best road trips in Italy. 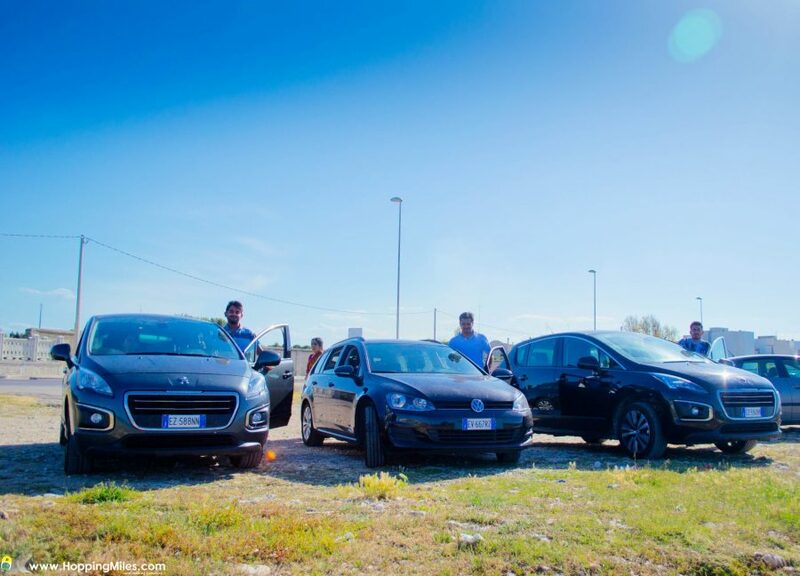 We didn’t always hire a car for all the days we were in Italy, but did it strategically, which we will explain in the due course of this article. While exploring cities, we used local transport like Metro, trams and bus. When feasible, we took intercity trains. We hired a car only when we felt an absolute need of doing so. And being avid road trippers, we enjoyed taking on Italian roads – sometimes driving in between choppy cliffs and deep blue ocean, sometimes cruising along state-of-the-art highway, sometimes creeping under tunnels that don’t seem to end, sometimes stuck in weekend highway jam, sometimes slowing down in countryside roads to see the hay bales neatly rolled up, sometimes driving along the coast for hundreds of miles but never to drive for the sake of it! With such a pleasing experience, I would recommend that everyone should go road trippin in Italy at least once in a lifetime! Assisting you in your road trip adventure is your travel buddy – Hopping Miles. So, here it is – Road trip in Italy. Well, for a good road trip, what do we need? A reliable and cost effective car and a comfortable place to rest for the day after a long day on the road. Right? I know you are nodding your head there. Let me ease this process for you by listing a couple of websites which we always use on our travels. We booked the car from this website which compares different vendors, so that we can select the car that matches our taste and budget. Check prices now by entering the place in the search box below. With so many booking sites and hundreds of hotels and apartments, its indeed difficult to choose the place which suits our taste. That is where this site comes into picture. We always check the prices of hotels/apartment from this website and compare prices offered by different booking sites and book the accommodation from the one that offers the best price. Compare hotels by checking in this search box below ! I will list some places you can visit on your self drive holiday in Italy. And for our exact itinerary, you can check the next section. Lets look at each stop and see what we did there! We flew into Rome and flew out of Rome to Bangalore, India. We spent 3 days in Rome – roaming around the city in hop-on hop-off bus and explored the World’s smallest country – Vatican city too! Hop-on Hop-off bus is the absolute best way to explore Rome. We get a bus pass which we can flash to the driver and hop onto the bus and hop off at any stop and this cycle continues. We did this and loved the convenience and frequency of buses available. We bought our tickets from this link here: Rome Hop-on Hop-off Bus Ticket. After blissful 3 days of roaming in Rome, we hopped onto Vatican city for a day, which was just next door to Rome. After exploring Rome and Vatican City, we picked up a pre-booked rental car, thus flagging off our Italian road trip! We got the best deal for our car rental from this website here. Our initial plan was to drive down to Pompeii and Naples before checking into our lovely room in Sorrento in Amalfi Coast. As luck would have it, we had a delay due to a situation and could start from Rome only in the second half of the day, so we changed our plan and drove to Sorrento with a small detour at Caserta. The highlight of Caserta is definitely the ‘Palace of Caserta’. This UNESCO Heritage site sprawls over 60 acres with a 5 floors and 1200 rooms!!! Apart from the place itself which is impressive, vast gardens take away all the credit of being stunning with beautifully curated plants and water fountains at regular intervals. Though Palace of Caserta was under renovation at that time we had been there – it didn’t fail to amaze us! Traffic jam on the way to Sorrento. We were stuck in jam inside the city too! After a mesmerizing evening drive along the plunging Amalfi coastline as the sun retired for the day, we got stuck in the narrow lanes of Sorrento city. Traffic pile up due to road restrictions come into effect after sundown, this resulted in us getting struck in a traffic jam inside the city. We got lost at many places and google maps weren’t of any help but the locals were really helpful and guided us very well in spite of having the language barrier. Next morning, we strolled around Sorrento town and decided to hop on to Capri Island and indulge in the unique experience of Blue Grotto! So, off we were to Capri in a high-speed ferry from Sorrento! Capri was a pleasant surprise. From the time the ferry approached the island, until our way back to Sorrento – Capri captivated us! Jagged cliffs rising high from the deep blue Tyrrhenian Sea underneath – in this small island off Italy’s Eastern Coast. In spite of thousands of tourist inflow every day, much of Capri’s natural beauty is preserved to retain its charm. The proof of which are the narrow roads just enough to pass only 1 vehicle on either side. Nature’s bounty has been preserved and not given way to modernisation! After a refreshing day in Capri, we were back on the road. How eager were we to drive in this piece of land! We took it easy while driving the Amalfi Coast by not rushing it. We rolled down the windows and breathed the fresh air of Amalfi Coast – sinking it all into the skin. The warm air rising from the sea blends with the fragrance of flowers slopped in every corner together with the scent of Citrus which grows here in abundance. Roads that snake all the way along the plunging coastline coupled with stunning views makes Amalfi Coast one of the scenic routes to drive in the world! In case you aren’t doing a self guided driving trip and still want to experience the thrill of a road trip then try this tour or this one. After Italy surprised us with Amalfi coast drive, we had another visual treat waiting for us in Alberobello. Entire town with whitewashed houses called Trulli awaited us in Alberobello. The Trulli of Alberobello is a hut made of traditional Apulian drystone mainly consisting of hard limestone. The roof of Trullo is conical shape with stones stacked tightly on each other. If you fancy staying in a Trullo – you can as well do it. There are many BnBs and boutique Trullo stays in Alberobello. Check the prices now by entering your dates below. We stayed in a small town called Eboli before traveling to Alberobello. Pizzas here are yumm! The drive from Alberobello to Bari was all along Italy’s southern coastline. The main reason for us to drive to Bari was to return our rental car which we hired in Rome. That said, DON’T be fooled into thinking that our Italian road trip is over! Rental cars which we returned in Bari. We were a family of 12. So we hired 3 cars!! Back to Italy again for yet another road trip! We returned the car in Bari and took an overnight ferry to Croatia. Read about our experience in Jadrolinija ferry from Bari to Dubrovnik in this article here. We explored Croatia, Bosnia and Herzegovina, Montenegro and Slovenia. We returned to Italy through Slovenia via road and settled down in Venice for the day! Some pics of our road trip in Croatia and Slovenia. We roamed around Venice, hopping numerous bridges in the Venice Water bus or the ‘Vaporetto’ with a day pass. Watching gondolas pass by, hearing barcaroles sung by gondoliers who sway the gondola from under one bridge to another – Venice was all about life and history in a water land. If you are in Venice, do not miss the Gondola ride! After spending time to our heart’s content in Venice – It was time to move on. This time around, we did not hire a car. Remember what I had told earlier, rent a car only when necessary. As we were to stay in Milan for the next couple of days – we didn’t really need a car to go around – so, we took an intercity train from Venice to Milan – Italy’s fashion destination! We went to see the ‘Duomo di Milan’ but ended up attending a concert! You can also do a day trip from Milan to Lake Como – Details here. This wouldn’t be any ordinary morning – this would be a special one. A morning that showed us a light of day like no other morning. Sun rays piercing through the plump mountains, gliding though Lake Como before hitting the glass window of the train from Milan to Tirano. The day could be called a Train day. Our train journey started in Milan at 5.30AM in the morning and ended at 9PM the same day in Milan. Why do I call it the train day? That’s because we spent the major chunk of the day in train. From Tirano, we ascended the legendary Bernina express. The rest was sequences just like dream. Was I dreaming? Maybe, Yes – but certainly, No! As the train chugged away from Tirano, we scaled altitude by slowly climbing various bridges and passing through gloomy tunnels. Scenes distinctly vary from tiny villages puddled in lush green valley down below to glaciers melting to form electric blue lake. We alighted in St.Moritz town in Switzerland – spent 2-3 hours before getting back to Bernina Express to return to our temporary home in Milan. It was time to get back on the road. We hired a car from Milan and drove to the land of Ferrari – Maranello! We drove from Maranello to Pisa through Florence with vineyards for company. Driving in the Tuscany region was another dream come true. The entire region is sprinkled with acres of vineyards brimming with grape-bearing vines. Roads rise and fall at changing intervals – giving us elated views of the landscapes filled with different coloured flowers at each interval! See the colours of views we saw from the highway – here in this post! Standing tall, leaning for centuries is the ‘Leaning tower of Pisa’. There is something charming about Pisa. That white tall leaning structure, the green grass around it, the blue skies – everything makes it photogenic! This wonder of the world and UNESCO Heritage site had to be visited and thus was! While in Pisa, a must thing do is to go inside the ‘Leaning Tower of Pisa’ and climb all the way up and get a bird’s eye view from the top! It is sure inundating but is very exciting at the same time. We were running short of time as we had to drive to Rome and return the car, but wanted to go to the top of Leaning tower too. The lines for the ticket was long and we gave it a chance and finally did it. So, its a wise thing to book tickets in advance. We drove back to ‘Leonardo da Vinci–Fiumicino Airport’ in Rome and returned our rental car that showed us some surreal sights for over 2 days. I know we have left out many other beautiful spots and cities in Italy. We knew about some but couldn’t manage to do it – Florence, Siena, Naples, Pompeii, Sicily, San Marino, Gradara. Some we regret not knowing about, during the planning stage like the ‘The Great Dolomite Road’. But, there’s always a next time! 17 cities and towns not to miss in Italy! Hope you have liked our itinerary and all geared up to prepare yours! Let us know in the comment box below if you have been to the places we have been and share your experiences about that place with our readers! Beautiful photographs and interesting narration! Great trip and great photos. I would like to ask can you plz tell hidden gems, non touristic places in italy, moreover budget living in italy. Thanks. Good one guys.. It is very helpful for planning our road trip.. Cheers and thanks for putting this up!! Great info and pic! I’m planning on a roadtrip to Italy too, so wondering how long did it take for your first and second leg and Croatia? This is a amazing article (along with the other one – things to know before self drive in Italy). Can you please share few more details (if possible) on the places (hotels/B&Bs/Lodges etc) where you stayed for the night. Thanks. Glad to see your article, the journey & itinerary looks fantastic as well great collection of pictures. Hey amazing itinerary. I wanted to know if you needed international driving licence or just the indian driving licence worked? Also which company did you hire the self-drive car from? WOW, This is a really great post. I like your post information because I love to travel. When I read your article I get more information about Italy. Thank you for sharing a very helpful and tips post. Hey great read..i am off to a roadtrip from venice to south italy from 19 march for over a month long..I was wondering if i should hire a care throughout? is that a good idea..venice, florence, pompeii, matera, calabria,and then sicily. IS preebooking necessary or should i just land and book one? i will fly from catania (sicily to rome) as i fly out from rome to mumbai. Also wanted to check how expensive does it get fuel wise? we are 2 people with 2 bags. A car isn’t required to travel inside the cities and it is best to use local transport when exploring the cities. I’d recommend self drive after you get out of cities. Maybe you can do Venice-Florence in train and hire a car from Florence and drive down to Rome and Pompeii. Do not miss the Amalfi coast drive – its heavenly 🙂 Prebooking saves last minute hassle and we get time to book the cheap and best car rental. Hi , Awesome blog on travel. Great pics. We are traveling to Italy in April end and planning to self drive around Tuscany for two days. We will be arriving in Florence from Rome by train and will be there for three days. We hope to spend two days in Tuscany country-side and want to hire a self drive car for the same. It will be great if you can suggest some thing. Since its a Sunday when we arrive in Florence, not sure if we can find an agency open on that day. This is a brilliant find ! Love the information shared here and will definitely redefine my itinerary as I plan 🙂 Thanks for sharing your experience with the cool photos . I love road trips. For me it is the best way to travel. And Italy looks more perfect by a drive-off. There is the Lake Como and Amalfi Coast is like my dream location to see. Plus these pictures looks so good. Look like you had fun in your vacation. So glad I stumbled upon this post, very useful. If I may ask you which were your fav top 3 places that are an absolute must visits. Also, which self drive would suggest – Amalfi coast or Tuscany? Thanks in advance. If given a choice between the two, I’d choose Amalfi. That said, at some stretches in Amalfi coast is narrow and winding – attempt this if the driver is confident enough 🙂 We could do it though it was our first self drive experience abroad. Choice is yours. We booked our car from this website. It has good choices and pricing options. Thanks for the list of suggested road trips. I’ll be traveling soon, so this is going to help me a great deal. Hi! Thanks for this share. What about parking in amalfi / and around? Was it pricey? I’m planning Como to Amalfi (1 day in Capri) and Milan and Naples on the way to Italy and when leaving. Debating getting a car or just train and ferry? Realy some awesome trip in Italy, I used to live here, and my family was return after three weeks in this summer. wow this is awesome stuff lots of value . i never visited italy bt your article eager to go there. thanks ASHWINI for sharing with us. It is a nice explanation of the trip. I am planning as well but just planning to do a self drive in Tuscany region, but bit scared that as how easy or difficult will it be do drive left side of the care. Please do let me know if it was fine. We didn’t enter Florence with our rental car but Pisa was not difficult for parking. What would be your suggestion for a main town to fly into and out of in Italy? we want to fly in hire a car do the road trip and then fly out of a different city without having to retrace any of our travels. Hi! This was perfect information for us. We are planning our honeymoon and want to cruise around Italy. We are thinking to fly into Naples and self drive up through Rome, Florence and Tuscany, then to Venice and end our trip with a new nights down in Amalfi. Do you suggest we drive the whole time? Or should we drive up and fly back down to be in Amalfi? We didn’t feel we needed a car in Amalfi, so we were thinking to use public transportation there. We are looking to explore and take our time along with stay at AirBnbs along the way. Good idea Heather. You don’t need a car in Amalfi unless you have plans to drive along without any stops. As you are staying for 2 days in Amalfi, car isn’t a good idea because towns are small and parking is a hassle. Hey nicely described, well informed and amazing instructions!! Just one thing i wanted to know was how many days did it take you to complete leg 1 and leg 2 separately? So how many days was this entire trip? And would you recommend this type of travel with a 2 year old?